If the bellows have been damaged by marine growth, water will enter the stern drive, resulting in internal damage to the mechanical components. 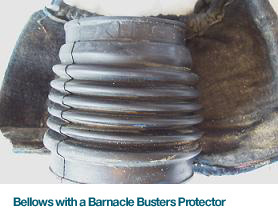 Protect your bellows with Barnacle Busters Bellows Protectors. This will save you the inconvenience, not to mention the cost of repairs to your stern drive due to water ingress. 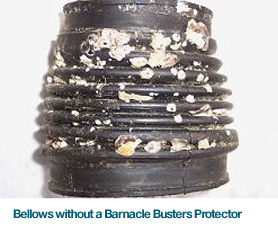 By using a Barnacles Busters Bellows Protector, the bellows will no longer require cleaning and will remain protected between haul-outs and servicing. We recommend that a new Barnacle Busters Bellows Protector be installed during routine servicing.